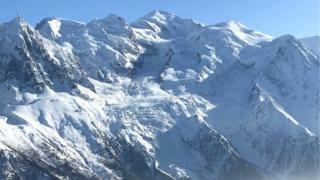 France has issued a decree restricting access to the summit of the country's highest mountain, Mont Blanc. As a result of overcrowding and safety risks, climbers will not be allowed on the peak's popular "Royal Route" for the next eight days, officials said. Authorities for the Haute-Savoie region said the shelter's overnight capacity of 120 people was frequently being exceeded, which presented "safety and public order" risks. "Access to the summit of Mont Blanc via this route... is only permitted to those who have a reservation at the Gouter refuge," an official statement reads. Mont Blanc, with 11 peaks reaching more than 4,000m above sea level, is western Europe's highest mountain range - and a challenging area for climbers. The Mont Blanc massif is extremely popular with walkers and climbers but is Europe's deadliest mountain range, claiming some 50 lives each year.